"Anna and I had many great times together. Wonderful..."
"Our Aunt Anna was so sweet, caring, and fun! A beautiful..."
"Anna was a sweet, happy, friendly, ..."
"We are praying for you all in this difficult time." 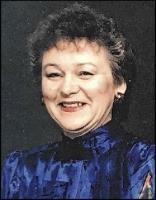 Anna Marie Krause Frost of Prattsville, Arkansas, died on Tuesday, April 2, 2019 at her home at the age of 84. She was born July 5, 1934 in Herington, Kansas, the daughter of the late Robert Carl and Minnie Marie Jones Krause. Anna was baptized in the Lutheran Church. She was an artist who enjoyed cooking for her family, arts and crafts, was an avid bird watcher, and loved nature, especially flowers. Anna is survived by her daughter, Deborah Dyer of Prattsville; son, Edward Jack Frost of Vancouver, Washington; granddaughter, Chyanna Burke (Andrew) of Prattsville; 3 great-grandchildren, Jim Alan Burke (Kaitlyn), Morgan Elizabeth Burke and Caitlyn Lindsay Burke; brother, Robert Carl Krause of Vancouver, Washington; father of her children, Jess Vern Frost of Portland, Oregon; and a host of nieces, nephews and extended family members. In addition to her parents, she was preceded in death by her sister, Nadine Roley. Graveside service will be Monday, April 8, 2019 at 3:00 P.M. at Philadelphia Cemetery in Prattsville. In lieu of flowers, memorials may be made to Ridgefield National Wildlife Refuge, 28908 NW Main Street, Ridgefield, WA 98642.